And the face of our interlocutor crumples, all the time. No. Of course, the 30 days of a normal Indonesian Tourist Visa on Arrival are not enough to explore an archipelago with 20-thousand-odd islands. In the Southeast Asian nation with the highest number of islets and infinite ferry routes connecting them, spanning from the Indian to the Pacific Ocean, 30 days can't be enough for real exploring and adapting to unpredictable boat schedules. In our case, after returning from Europe to Asia with Scoot Air's ultra-cheap flight from Athens, we were planning to venture out by Pelni to West Papua, and from there backtrack all the way to Sulawesi where, among other things, we visited the amazing Tangkoko National Park. We knew we needed the security of the most important asset for such a journey: time. Visiting Indonesia is easier than before: individuals of about 160 nationalities are now entitled to receive 30 days free Indonesian tourist visa on arrival, provided one has return flight tickets, in many air, sea and land ports across the country. But it only comes in a 30-day variation, and it’s not extendable. This is perfectly fine for a week-long vacation in Bali, or a visit to Java to bask in the glorious sunrise at Borobudur, for example. Otherwise, you can still land and pay 35$ for a 30-days Indonesian tourist visa which can be extended once while in the country, yet at the cost of visiting an immigration office multiple times. 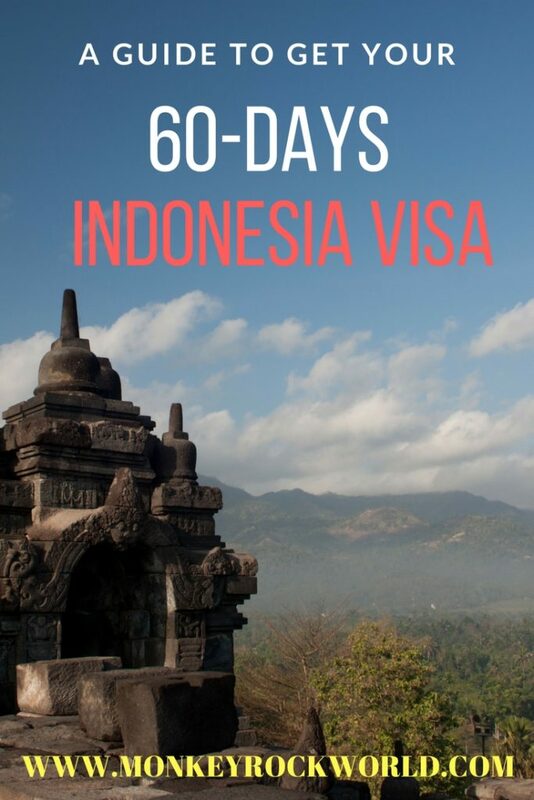 But if you want to stay longer, or you don't want to get caught up in red tape while traveling in some off the beaten path island, it’s necessary to visit an Indonesian Embassy and apply for a 60-days Indonesian tourist visa. This visa can, in theory, be extended in Indonesia another two times, for a maximum 6 months stay, as some online reports demonstrate. This post will explain what we did to get our 60-days Indonesian visa in the Indonesian Embassy of Bangkok, Thailand. We live in Penang, which has an Indonesian consulate, and one in which it was pretty straightforward to apply and get such visas. But of course, when our time to apply came nearer, Murphy’s Law applies and things must change: since August 1st, 2017, a new head of mission in Penang has made things more difficult, and now there’s apparently a “quota” of such visas issued. In practice, the majority of travelers who reported their experiences in online forums said they have been refused 60-days tourist visas from Penang since August 2017. Such a pain to add stress, kilometres and expenses to an otherwise pretty straightforward application in our hometown. And yes, we could have flown to Indonesia, paid $35 for a one-month visa, and then extended it for another 30 days, but thought best not wasting precious traveling time visiting offices and immigration departments while on the road — especially because you never know what you find once you get off the well-worn track. After a bit of panicking and googling, we realized that 60-days visas are still issued in the Indonesian Embassies of Bangkok, Singapore, and Kuching — where we were in July, but with no plans of going to Indonesia as of yet! At last, we decided to go to the Indonesian Embassy in Bangkok, where we were headed to visit a friend anyways. 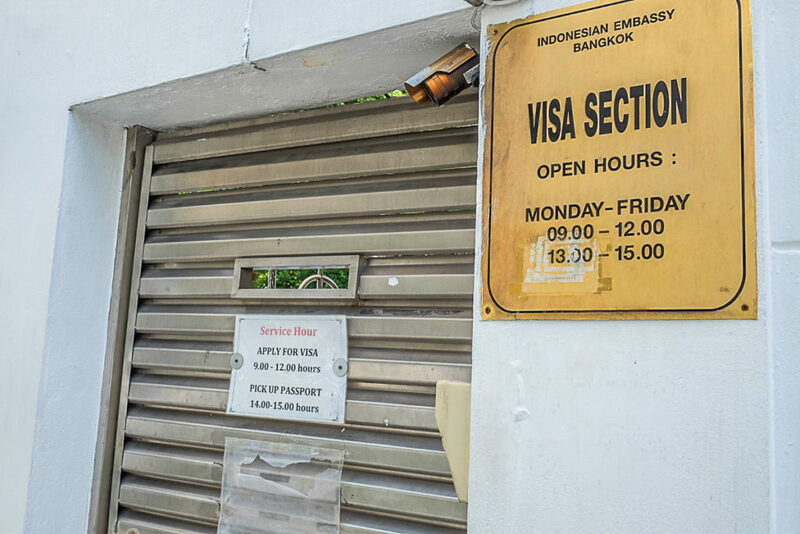 Based on online reports, the Indonesian Embassy in Bangkok issues 60-days tourist visas provided one has not been in Indonesia for a period of 90 days. If this is your case, try Singapore, as it seems they are not enforcing that rule. Applying for a 60-days Indonesian Tourist Visa in Bangkok is pretty straightforward and efficient, provided you have all the required documents in place. The embassy is at 600–602 Petchaburi Road, in 10 minutes walking distance from the Ratchathewi BTS station — take Exit 4, go downstairs and turn back along the road, walk 100mt to the first junction, turn right, continue walking for 5/10 minutes and you will find the embassy’s visa section on your right. It’s a small door, just push it open and get inside. Remember well: you must dress modestly or you will be refused entry. Wear a decent shirt and some long pants, enclosed shoes, no flip-flops or toe-revealing footwear. Photocopy of your return flight tickets to Indonesia (Ok, some have said that their return tickets were not asked. You can try your luck, but in our case, return tickets were asked). A copy of your bank statement, showing you have at least 2,000 USD to cover expenses for the length of your two months stay. Two passport photos (We only had one each, and it was enough, no questions asked). 50USD cash, in $ only, to pay for your visa. Bring the cash with you as there are no banks conveniently located in this area. There is a cheap and efficient printing and photocopy shop right across the road from the Indonesian embassy in Bangkok, just downstairs from the pedestrian flyover. Prints where 5 Thai Bath each, and photocopies 2 Thai Bath per piece. The visa application submission hours at the Indonesian Embassy in Bangkok are Monday to Friday from 9 am to 12 pm. Enter the embassy building, and a guard will hand out your form. Fill it up: it’s not necessary to write both of your employer’s and your Indonesian sponsor addresses. Once you have compiled the application, bring all the documents, including the photocopies listed above, to the first counter where they will be checked and organized together, and given back to you. The clerk will ask you to go to another adjacent room, at counter 2, for further screening and getting a receipt. You will hand in the receipt, payment of 50$, and your passport at counter 3. The officer will leave one part of the receipt to you, and ask you to return in two days to collect your passport between 2 and 3.30pm. Applying at the Indonesian embassy in Bangkok was quite a straightforward process for us, but we welcome feedback in the comments. Have you had a different experience? Did anything change in the application process? Please let us know so that we can keep this online reference updated, and help more travelers get off the beaten path in beautiful Indonesia. Hi! Thanks for your post. A question. I cannot understand how long it takes to get the visa. If I drop the application on a Friday, when would it be ready for pickup? Monday or Tuesday? Thanks!